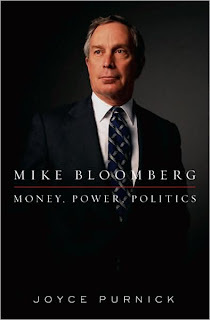 Despite transitioning from reporter to more analytical columnist, former New York Timeswoman Joyce Purnick, in her slender new biography of New York's singular mayor, Mike Bloomberg: Money, Power, Politics, avoids rigorous analysis, praising Bloomberg as a productive pragmatist, who has governed mostly "prudently," while acknowledging he left some sticklers disappointed on issues like development. The book lasts only 227 pages before the Acknowledgments, and a good third concerns Bloomberg's pre-mayoral activities. That means no one should expect a thorough analysis of Bloomberg's two terms or an indictment along the lines of, say, City for Sale: Ed Koch and the Betrayal of New York. City Council President Christine Quinn, Public Advocate Betsy Gotbaum, City Planning Commissioner Amanda Burden, and Comptroller Bill Thompson each get a single mention. The Nets arena gets two. The terms "Atlantic Yards" and "Bruce Ratner" do not appear. Nor does, say, Finance Commissioner Martha Stark, who resigned under a cloud. And in every rundown corner of the city he aggressively cleared the way for renovation and real estate development, to the chagrin of serious city planners and devotees of city landmarks, to the delight of builders, construction unions and pragmatists who share his preference for imperfect development over neglect. A reader might conclude that casual city planners and those who care partially about landmarks are fine with Bloomberg's record. But Purnick sets up a false dichotomy between imperfect development and neglect, fails to look into projects like Atlantic Yards, and does not even hold Bloomberg to his own standards, as I point out below. Purnick couldn't not know more about Atlantic Yards. Even her newspaper covered it to some extent. And AY uber-opponent Patti Hagan, who shares mutual friends with Purnick, assures me she provided the biographer with copious background material on the controversy in Brooklyn. The Bloomberg doctrine requires some tunnel vision and some callousness , too, because to get where he's going--to serve the greater good, as he would put it--he won't necessarily stop to help those who fall by the wayside. It doesn’t allow for introspection or empathy either: they slow things down. Some at Bloomberg LP are convinced they were made part of the boss's "rebranding." As one employee put it, "There are those who believe that Mike and Patti plotted his political career by winning the loyalty of all the cultural and social organizations, causes and charities that he supported, developing a reservoir of social ties, good will, creating a buzz that became a potential, silent base of support spanning a broad range of the city's ethnic and political terrain." Michael D.D. White, who has plumbed Bloomberg's strategies in more depth than has Purnick, offers a more stringent analysis on his Noticing New York blog, suggesting that the would-be mayor was far more strategic than the biography allows. Oh, and there were all those rotting neighborhoods of abandoned factories and collapsing warehouses; maybe he could rewrite the city's zoning codes to turn decayed manufacturing sites into residential blocks, and get the real estate barons to transform eyesores into luxury suites. It was not quite that simple; some of those decayed manufacturing sites still had uses, and it was city and state policy--remember the battle over the reform of the 421-a law?--that encouraged luxury development. Purnick offers four pages on the West Side Stadium battle, astutely pointing out that the deciding factor was the role of the Dolan family, owners of competing Madison Square Garden, “motivated not by the needs of the community itself or the niceties of city planning, but by the imperatives of commerce.” Thanks to the Dolans' spending on advertising and lobbying, the voices of community opponents were amplified far more than in battles over Yankee Stadium or Atlantic Yards. As I pointed out September 28 (before having read the book), Purnick notes that Assembly Speaker Silver, who killed the stadium, helped ensure Bloomberg's re-election by taking the biggest obstacle off the table while shielding him from blame from labor unions and developers. In trying to fulfill a purely personal ambition, Bloomberg had betrayed his own standard for political behavior. However, Purnick does not delve into the full drama of the term limits switcheroo, such as how Council Member Darlene Mealy, under pressure from Quinn (and presumably Bloomberg? ), reportedly threw up before the vote. After blocking Giuliani’s subsidies to new stadiums for the Mets and Yankees in his first year, judging, in his pragmatic businessman’s fashion, that the city could not afford them, Bloomberg later relented. He was lavishly generous to the two teams and their ultraluxurious stadiums, as well as to a new basketball arena in Brooklyn. The stadiums benefited from tens of millions of dollars in city investments, tax breaks and subsidies, bundled into complex deals whose true cost to the taxpayer may never be clear. The city will gain from economic activity in the long run, the mayor said, as all mayors say about sports stadiums everywhere. Rarely do the predictions meet the promise but the stadiums are built anyway. Tens of millions? Hundreds of millions for each, at least, likely much more. While Purnick does point out that predictions don't meet the promise, she neglects the opportunity to cite the New York City Independent Budget Office's (IBO) critique of Bloomberg's sports facility deals or Bloomberg's own erroneous pledge that the only city money for Atlantic Yards would come from new tax revenues. She ignores the pushing-the-envelope creativity of the city's financing plans, particularly the furor over Yankee Stadium, which led to multiple hearings in the state Assembly and Congress over those plans and the city's questionable valuation of property. Bloomberg's applied his design sensibility to his company's midtown headquarters, not to city planning. The Nets arena planned for central Brooklyn is a case in point. It originally held great promise as a glistening glass wonder designed by architect Frank Gehry. When the developer, bowing to the economy, came up with a less expensive plan by a pedestrian architect and the new design for the Brooklyn stadium looked like nothing so much as a bland, boxy factory, Bloomberg backed that, too. Development is development, good for the city's economy. It's more than that; it's an idée fixe. When the IBO said the arena would be a money-loser (after Purnick's deadline), the mayor dissed the IBO. In other word, Bloomberg is less a pragmatic businessman than a mayor who wants to cut a ribbon. And he even claims "we don't have a future" without the arena, comparing it to Central Park or Prospect Park, two public parks, not a sports facility with a fig leaf of public ownership and a $400 million naming rights giveaway. The changes made way for… the renewal of Fourth Avenue in Park Slope, where expensive apartments began to replace chop shops and gas stations. The new rules also restrained some development in congested residential neighborhoods and provided for some manufacturing and affordable housing at various sites, though nowhere near enough to satisfy critics who argue that too many of Bloomberg’s plans favor the wealthy. This is thin gruel. Purnick's not writing a "he said, she said" daily news report. Why doesn't she tell us that the administration resisted inclusionary zoning while upzoning part of Fourth Avenue, then later offered such a bonus for affordable housing on another part of the boulevard? Why doesn't she say anything about his policy toward rent regulation? That tension between eager development and prudent planning is a permanent feature of New York politics. Mayors and other elected officials are inevitably accused of favoring developers who contribute handsomely to their campaigns. Bloomberg’s self-financing left him immune to that suspicion, but not to being assailed for favoring friends in his own class of business heavies. Again, Purnick suggests that only sticklers find fault with Bloomberg, while many community activists do so, as well. And consider that Bloomberg, in his much-lauded PlaNYC 2030, sets out the right way to develop over railyards, and conspicuously ignores Atlantic Yards, for which the process does not meet those standards. That contentious rezoning deserves a lot more voices, such as, say, those of the Rutgers graduate students who pronounced very mixed results. Sullivan appeared in a mayoral press release praising the rezoning. Bloomberg governed not with dramatics, but with ideas... He did not create the real estate boom that came with national prosperity a few years into his mayoralty, but unapologetically pro-development, he used taxes and incentives to exploit it and then adjusted as best he could to the subsequent bust. Did he use taxes and incentives to exploit it or did he channel more luxury development than necessary? Did he adjust as best he could? Who says? Purnick does allow that Bloomberg "bowed too low to municipal labor unions," and the long-term impact of the mayoral budgets has generated some fierce criticism from the center-right. It's only near the end of "Mike Bloomberg" that Ms. Purnick briefly focuses on the issue that his mayoralty is likely to be judged by: his second-term fiscal stewardship. Mr. Bloomberg, she says, "followed the pattern established by other mayors." Concerned with his re-election prospects, "he routinely granted all municipal union increases with no strings attached," hoping to ensure "labor peace." Astute reporter that she is, Ms. Purnick thus undercuts her own thesis about Mr. Bloomberg's ability to behave as a consummate manager, not a garden-variety politician, though she doesn't seem to notice the contradiction. This failure of imagination on Purnick's part is, as the Marxists are wont to say, no accident. It is easily explained by a phenomenon that the sociologists Vidich and Bensman called, the mobilization of bias. This occurs when there is a dominant ideology-a common perceptual lens-that acts as a filter on reality; one that generally favors ruling elites in a governing structure. Clearly, Purnick's own world view doesn't stray far from this mobilized conventional wisdom. Who is Joyce Purnick's husband? Could it be Max Frankel, former executive editor of The Times?